I bought this Peter-Pan collared shirt after work one night this week at the 24hr Kmart beside my work. I don't know why the Kmart is 24 hours, but I won't complain because I am often there at an odd hour. I have had this hat over 5 years, but never worn it because I always felt like I wasn't a 'hat person'. I'm still not sure if I am one, but I was okay with it today. My mum gave me the vintage hat pin for Christmas last year and I finally had a hat to wear it in. I was worried it would stab me at some point during the day. Today I hung out with my lovely BFF Sara and her daughter Ginger and then C and I went to see Tin Tin at the movies. I had a really good day, I hope you did too. 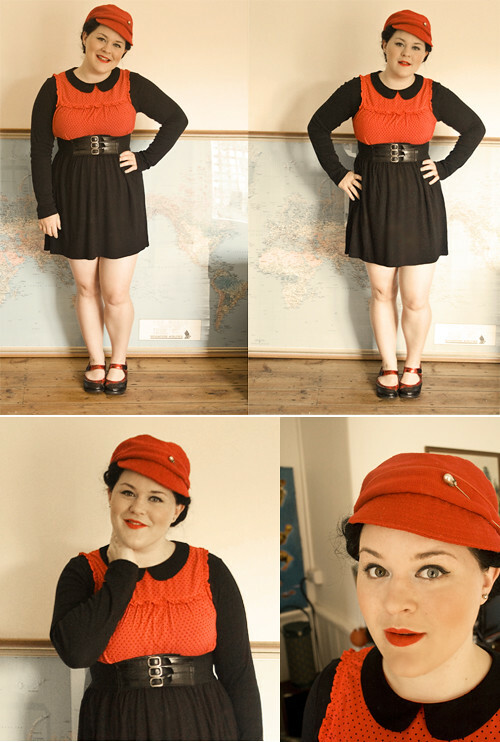 + shirt: kmart + shoes: minki + hat, skivvy & skirt: unknown + hat pin: vintage.